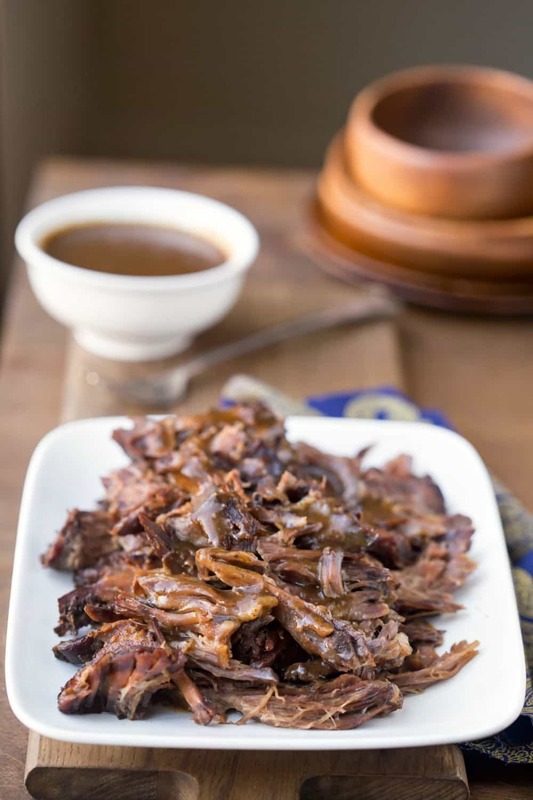 Crockpot Balsamic Beef recipe makes tender and juicy beef. Easy crock pot beef recipe turns chuck roast into a delicious dinner with almost no work! I love a good crock pot recipe. One that doesn’t take lots of prep and doesn’t call for a million ingredients. Most importantly, one that ends with delicious food. This, my friends, is one of those recipes. 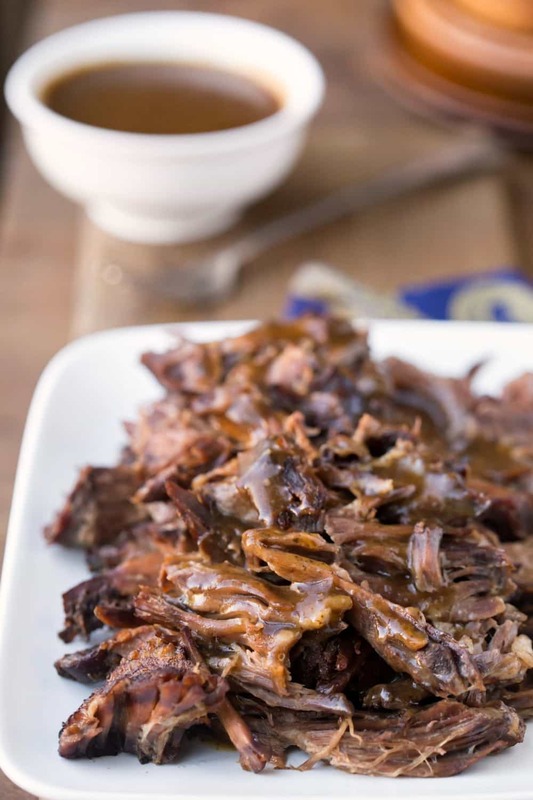 This Crock Pot Balsamic Beef Recipe takes less than five minutes to put together. The recipe calls for a fair amount of balsamic vinegar, but the long cooking time really mellows it out. This juicy beef that is delicious served over egg noodles, rice, or potatoes. This recipe also makes a great freezer meal. 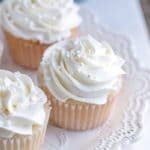 If you’d like to make it ahead of time, simply add everything to a freezer-safe container (I use a gallon freezer bag). Squeeze as much air out as possible, and then you can freeze it for up to three months. When you’re ready to use it, simply thaw in the fridge, and then cook as directed. More crock pot beef recipes! 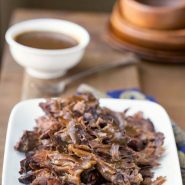 If you’ve tried this crock pot balsamic beef recipe, don’t forget to rate the recipe and leave me a comment below. I love to hear from people who’ve made my recipes! In a small bowl, stir together broth, vinegar, brown sugar, Worcestershire sauce, and liquid smoke (if using). Pour the broth mixture around the roast. Cover, and cook on low for 8-10 hours. Shred beef with two forks, and return to crockpot. Continue cooking for an additional 30-60 minutes. To freeze: Add everything to a freezer-safe container (I use a gallon freezer bag). Squeeze as much air out as possible. Then, you can freeze it for up to three months. When you're ready to use it, simply thaw in the fridge, and then cook as directed. Fantastic! This is going on the regular rotation. This is one of may family’s favorite meals! Thank you for sharing! I recent purchased an Instant Pot and was wondering if you know how this would translate to being made in the Instant Pot? I’m so glad to hear that! I’m not sure! I bought an Instant Pot around Thanksgiving, and I’m just getting around to figuring it out. Once I get the hang of it, I’ll be sure to come back and update the post with IP directions. I noticed there’s a glaze over the meat and pasta. What is it, and how do I make that? I just boiled the sauce from the crock pot and served it over the meat. If you’d like to thicken it, just make a slurry with a little cornstarch, and you should be set! How many servings should I expect from this recipe? 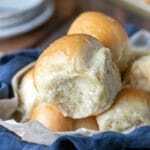 You should get about 8 servings from this recipe. It will vary a little depending on the amount of fat on the roast, but you should get about 8 servings. Hi Kate! What size crockpot do you typically use for this recipe? I’m hoping to make this soon! I know I’m about a year late on this post, but I was just wondering if you’ve ever added in veggies with the roast? Carrots, potatoes, onions, etc. if so do you add more liquid? Thanks! Is it ok if the chuck is frozen? I’ve never tried it frozen in this recipe. I’ve put frozen chicken breast in with other recipes, but I’m not sure with a larger cut of meat if it will work out right or not. If you try it, please let me know how it works out! I often put a frozen chuck roast in my crock pot and it woks fine. I want to add mushrooms to this! I nearly always do my pot roasts for shredding/pulling from frozen. Start them off on a high setting the night before and then switch to low for daytime cooking. Don’t lift ever the lid. Unless you’re turning the roast or adding flavours or liquid. Is it ok that the liquid doesn’t cover the meat completely? Yes, when I make it, the liquid only covers about about an inch or two of the meat. It’s a liquid seasoning that replicates the smoky flavor that you’d get with grilling or smoking food. It’s usually sold with the seasonings, and it comes in a small bottle. If you have any other questions, let me know! This looks like a fabulous weeknight meal. I do love the slow cooker meals. Thanks for linking up with What’s Cookin’ Wednesday! I LOVE balsamic, this sounds like the perfect crockpot recipe for me. Going to have to give it a try, pinning now! Thanks for sharing at Show Stopper Saturday! I’m committed to cooking more…and doing more crockpot cooking is one way I plan to do it for those weeks when I’m busy and just don’t feel like cooking at 6 pm when I get home. Thanks for a great way to get started. I love balsamic anything and in the slow cooker…? Sold! 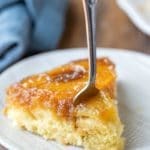 Love this recipe Kate!